After I finish a project I need to just play for awhile to decide what to do next. Every time I see a Friendship Star quilt I know I want to make one. I had a box of 3" finished triangle squares (no batiks) and a little bag of 3.5" green print squares so I started playing with a layout on the design wall. I think the blocks with the darker light colors will have to come out. Maybe they can be on the back. This will just be a small quilt to go in my gifting pile. I'm linking to Scraptastic Tuesday. Click here to check out the other links. Then I tackled the one I have been procrastinating about. I got the other 3 narrow borders sewn on and then I hung it on a double design wall to be sure they were just the right length. The trouble with sewing a border onto an all bias edge is that you want it neither too small or too big. Either way causes big problems once you get the outside borders sewn on. I think it looks good so I will cut the wide border today. While mowing the grass I spotted the greenery to be featured for the day. The bluish green hosta was only half this size last year. The leaves are fairly small on this one compared to my big leaf plants. I split this one a couple years ago so I have 2 or 3 of them. I counted 7 little tomatoes on the Early Girl plant and 2 or 3 each on several of the other plants. I don't remember how many days it takes for them to grow to full size and ripen but I suspect I'm going to have a lot of tomatoes at the same time. love that friendship star! so cheerful! I love the friendship star as it is. the mix of lights gives it dimension. Both quilts are going to be GREAT!!! I have the same hosta, and it has already bloomed! 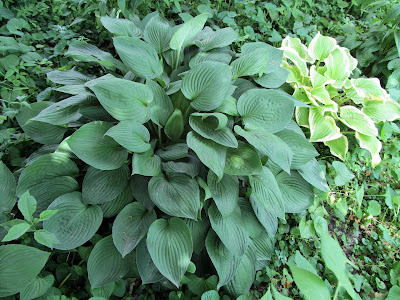 I like the hosta for the leaves.... the blooms not so much. We have been lucky to have some rain nearly everyday... lately and the tomato plants really grow!!! We are going to be in the same tomato boat soon! We have one of those blue green hostas - they're especially pretty on the REALLY hot summer days simply because their color is cooling to the eye. Really like that Friendship Star project (I would take out the darker blocks, too). I have a friendship star on my long lists of quilts to make. Nice arrangement. My hosta have gone explosive size this year. I love your play time with friendship stars. It's one of my favorite star blocks. So odd but this morning I got up early and sewed the binding on my Friendship Star quilt. I really love mine with all blues and the stars are white. Your hosta is really pretty, don't have a blue one myself. 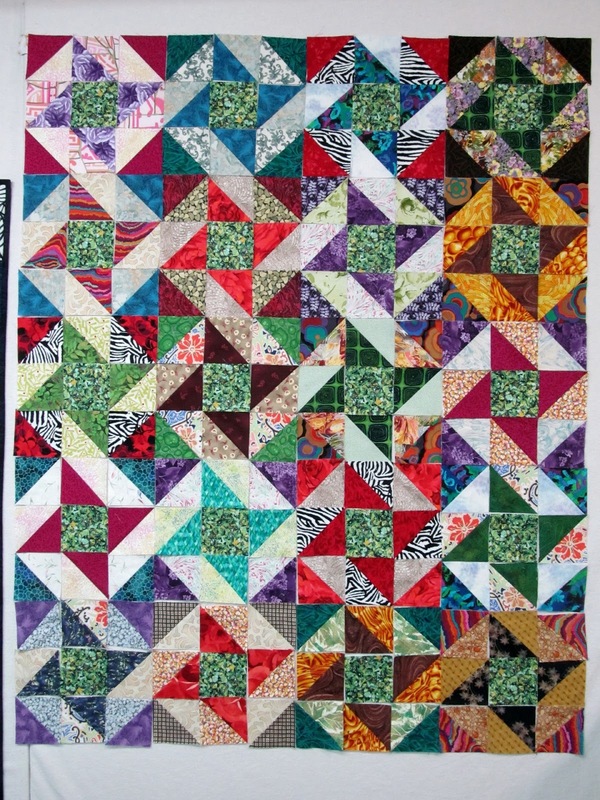 I really like your quilts and thought if you would just move the blocks around a little in the star top, you wouldn't have to take anything out. But then maybe you want a smaller quilt, I really like both. That Friendship Star is really fabulous. It really was a great color day! Making something out of a pile of triangles is a good thing! It will be a very pretty and fun giveaway. Glad you got your narrow borders on. Yes, too long or too short would be a big problem! That hosta has the most beautifully coloured leaves, I have one down here. 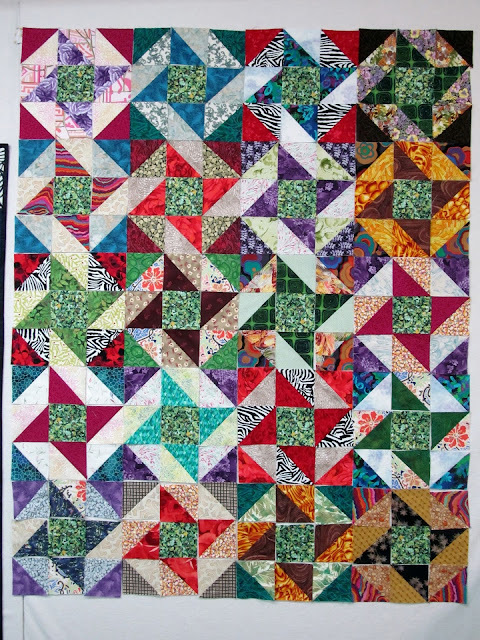 Love the quilt, great way with the green squares, I agree, darker are a tad too dark, But your eye for colour is SO much sharper than mine, you will know exactly what to put where. thinking you are talking about the top left and corner and the block below it if so yes they are a bit dark for light! if you know hat I mean. 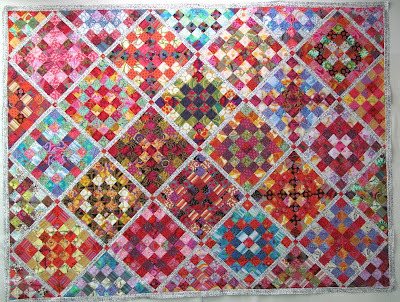 Loving this quilt though so many pretty fabrics in it. I hate working with bias avoid it like the plague . Oh, nice Friendship Star, lucky to have a find of the half square triangles to play with. I agree about the darker blocks, they immediately jumped out at me as looking "wrong." I too love the friendship star snd have never made a quilt with one, but it's the block I picked for the barn quilt I made for our barn. Also because I like the message it sends - that we're friendly, LOL. We made the barn quilt block ourselves and had the farm workers hang it on the barn. If you don't do it yourself, there are people at the extension service who will do it for you - at least here - for $350 per square. But I thought that was too expensive. Ooh I love the friendship star quil as is! 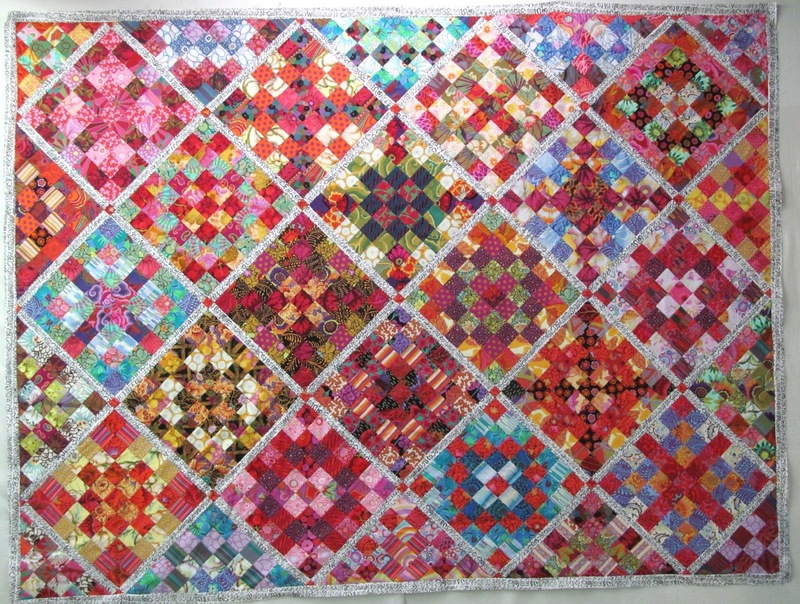 I love quilts where you have to work a bit to see the pattern but I know it doesn't suit everyone. The other one is a beauty too - good luck with the next border. Hostas are beautiful plants if you can keep the slugs and snails off them. Thanks for linking up to #scraptastictuesday!